Are you sick of this season’s juicy tomatoes? I hope not because, I’m about to blow your mind with the simplest and most delicious Italian take on a savory snack. 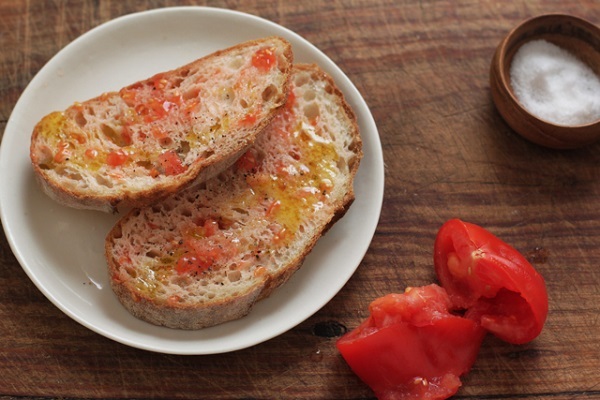 It’s called pane con pomodoro: a tomato cut in half and rubbed over bread until it is stained pink. It needs only a sprinkle of salt and pepper and a dash of olive oil on top. I know it sounds too simple, but it’s really delicious, especially if you toast the bread beforehand. Try it! P.P.S: Don't miss our sassy jewelry GIVEAWAY this week! Oh I never of tire of the garden tomatoes, and this sounds tasty, but then what do you do with the rest of the tomato? This is my favorite breakfast treat! I find it easier to grate the tomato on a cheese grater (cut side, so you end up with just the skin). Then you can spoon it on to the bread. 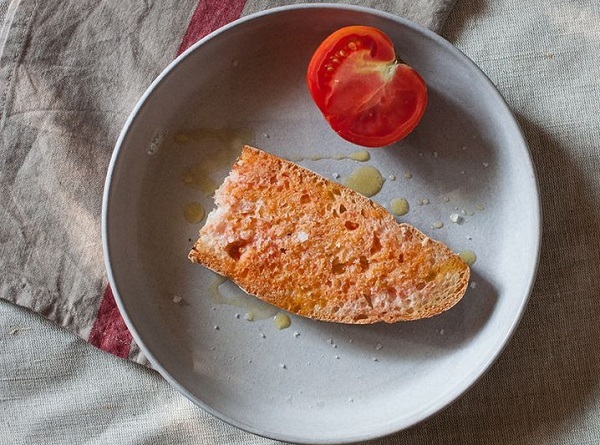 You can also rub the toasted bread with a raw clove of garlic before adding the tomato. With some really good olive oil and smoked salt flakes--Yum!